70 The PCB Magazine • March 2016 study. Based on the experimental results, we can conclude that the new conditioner is highly ef- fective in treating "hard to plate" PI substrates. Path Forward: Recommendation The current conditioner system has been tested with several PI substrates under con- trolled pilot scale environment. 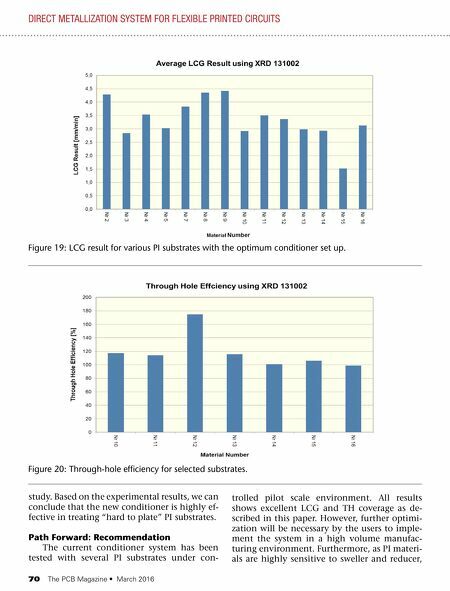 All results shows excellent LCG and TH coverage as de- scribed in this paper. However, further optimi- zation will be necessary by the users to imple- ment the system in a high volume manufac- turing environment. 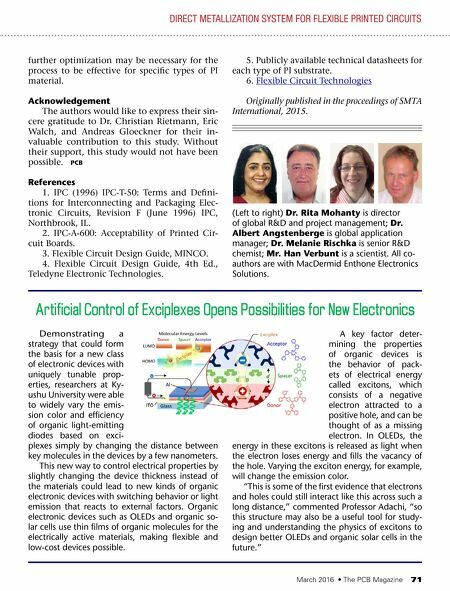 Furthermore, as PI materi- als are highly sensitive to sweller and reducer, direCt metallization system for flexible printed CirCuits Figure 19: lCG result for various PI substrates with the optimum conditioner set up. Figure 20: Through-hole efficiency for selected substrates.